BHOPAL: Heavy showers which began in the afternoon continued till late in Bhopal on Monday. Such was the intensity that the city recorded 50.2 mm of rainfall in two hours between 3 and 5 in the evening. A strong spell of moderate to heavy rainfall continued till night in the city. Officials of the Met department say moving of low-pressure area to Bhopal has triggered heavy rains. The figure for city rainfall in August till Monday-409.8 mm-is the highest in the past six years. P4In 2006, the city recorded 903.9 mm of rainfall. 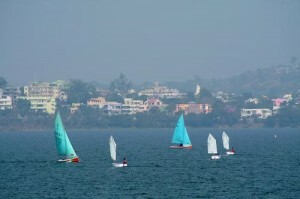 The officials of the Met department said the focus of low-pressure area formed over east MP has shifted to Bhopal. There were no rains in Bairagarh during the day. Bairagarh recorded a total of only 5.9 mm of rain in past 24 hours till Monday morning. The weather conditions would continue for 24 hours more. The heavy thundering was attributed to cumulonimbus clouds over Bhopal that a majority of times also result into lightning, the weather added. The rainfall count is expected to go up. The weatherman has also issued a warning for heavy rainfall at a few places in south MP, including Bhopal and adjoining Hoshangabad division in next 24 hours.